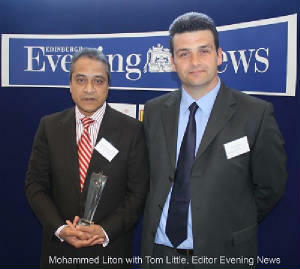 Mohammed (pictured here) was the recipient of two Evening News Best of Edinburgh Awards in June 2011. He received the Community Award and the Best Food Take Away Award. 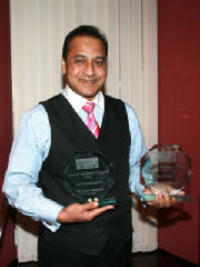 Mohammed, owner of the Clippers Indian restaurant, Penicuik, Midlothian scooped ‘Best Community Contribution Award 2010’. The winners have been announced in a ceremony was held at the Holyrood Road, head office of the newspaper on 11th August 2010.The categories included Best Community Contribution, Best Hibs and Hearts Fan, Best Post Office, Best Bar and Best Fish & Chip Shop. The top three nominees of each category were attended to the ceremony. The winner of the Best Community Contribution award received more than 3000 nominations while more than 14,000 votes were cast by readers in all categories. 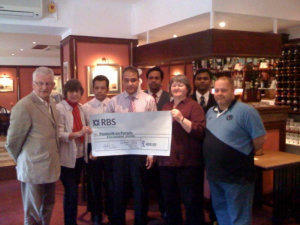 Mohammed Liton, Member of Edinburgh Bangladesh Association, has raised more than £3000 for a number of causes, including the Edinburgh Sick Kids hospital and children's cancer charity Clic Sargent in collaboration with local girl Chirsty Harrison who was diagnosed with cancer several years ago. The charity money was raised mainly by holding charity dinners in Clippers restaurant and donating 50 per cent of the takings. He has also recently sponsored the Beeslack Thistle Football Club, Air Training Corps, Eskmill Boys Club, Beeslack All Stars Disabled Sports Club, March Burn Playgroup, Penicuik Hearts Supporters Club, Penicuik Athletic FC and Penicuik Rugby Club. Philanthropist Mr Liton is always keen to lend a hand with fundraising efforts for deserving causes and even invites primary school kids to his restaurant, The Clippers, to learn the Bangladeshi culture through cuisine and skills of cooking. Commenting on this awards Evening News quoted - ‘‘ They were created to honour people in the Lothians who go above and beyond the call of duty for their community - and those who provide the best pints and fish suppers’’.Tom Little, editor of the Evening News, said: "We created the Best of . . . awards to offer a pat on the back to those who do good things at the heart of the communities of Edinburgh and the Lothians." Mohammed Liton was born in 1964 in Gourkaran, Kulaura in Moulvibazar district. He is the son of Dr Abdus Sahid (Rtd Post Master). Mr Liton’s early education was begun in Juri primary School and completed Secondary Education in N C High School Kulaura, higher secondary education in Kulaura Degree College. On completion of his commerce degree course in Kulaura Degree College he went to USA to study BBA at Wilkinson University in 1987. Father of three Mr Liton from Craigmount, Edinburgh moved to the UK in 1990. After a while he settled in Edinburgh and opened his own business in Penicuik in 1997. In the meantime, he gained useful experience working in different places. He also volunteered with Citizen Advice Bureau and helped many Bangladesh people from his voluntary capacity. He wishes to expand his charitable work elsewhere in Bangladesh. In particularly, he has a vision to promote education across disadvantageous rural area of Kulaura in Bangladesh.